To the novice eye, the stuffed pastry known as an empanada might look the same from country to country in South America, but there are distinct differences in each region. Most countries have a basic beef version and chicken version. Ham and cheese, potatoes, chile peppers, vegetables, seafood, hearts of palm, tropical fruits...whatever is available and popular in a particular region is usually featured in the local empanadas. A basic empanada dough recipe that will work with any filling. You can use this dough to make baked or fried empanadas. Learn how to make attractive empanadas with pretty decorative edges that don't leak, break, or collapse in the oven. This is a typical chicken empanada recipe, filled with a mixture of poached chicken, sautéed onions, green olives and hard boiled eggs. These empanadas have a filling made from ground beef, onions, black olives, raisins, and hard boiled eggs. This particular concoction is known as "pino" in Chile, and it is found in other recipes as well, such as the Chilean corn casserole called pastel de choclo. These unique and tasty empanadas have an outer crust made with masarepa, the precooked cornmeal that is used to make arepas. The filling is stewed beef (or pork) and potatoes seasoned with hogao. Leave the chorizo out of these empanadas for a delicious vegetarian version. Braid the repulgue (decorative edge) of the vegetarian empanadas in a different way so that you can distinguish them from the ones with chorizo (see picture). 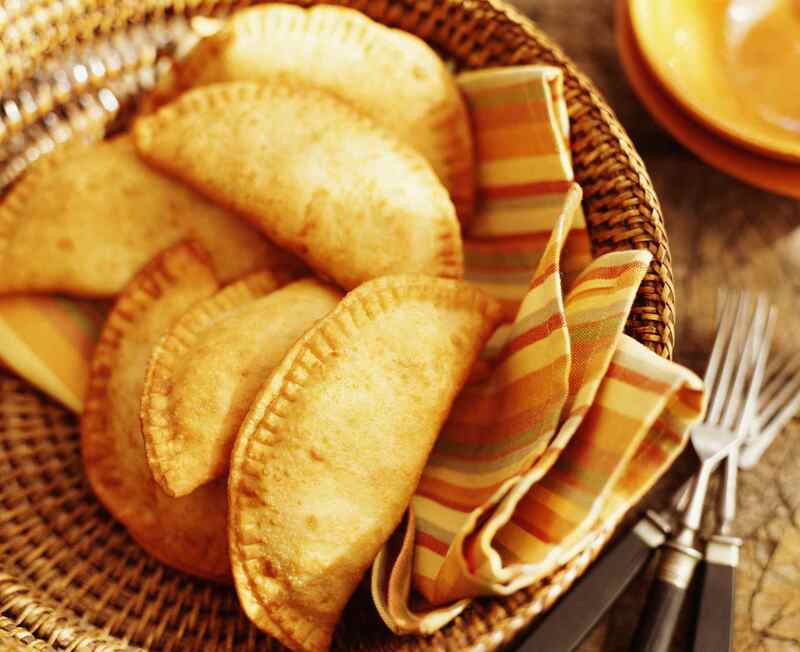 These empanadas, made with puff pastry dough instead of the traditional empanada dough, are popular in Peru. The creamy cheese filling is delicious, and using frozen puff pastry dough saves time. These delicious empanadas are filled with sautéed garlic spinach and a creamy cheese sauce. Garlicky spinach and creamy ricotta cheese go together perfectly in these empanadas. These Bolivian empanadas have a slightly unique style - the braid that seals the filling inside runs across the top of the pastry, instead of along the side. The beef or chicken filling tends to be much runnier and much sweeter than most other empanadas. They're often served with a plate and a spoon, but expert salteña eaters know how to enjoy them without letting the juices run down their sleeves. Brazilians have their own version of the empanada called empadas or empadinhas (little empadas). These empadinhas are filled with hearts of palm (a very common ingredient in Brazilian cooking), sautéed onions, and black olives. These are quick and easy empanadas with a simple melted cheese filling, but they are irresistible. Shredded chile-lime chicken, carmelized onions, and goat cheese fill these delicious bite size empanadas. These dessert empanadas are bursting with fall flavors.